Collecting is an evolving process that reflects where you've been, where you currently are, and where you might be going. My ever-growing collection of transferware is a good case in point. 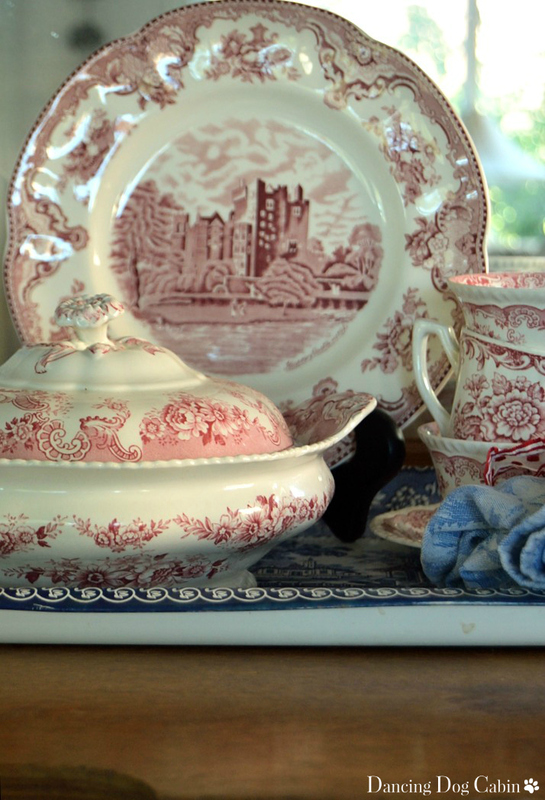 I'd been a red-transferware kind of girl for a long time. My mom always loved blue and white. I grew up with it. I ate off of it. It stared down at me from bookshelves and curio cabinets. So, once I had a place of my own, I decided I preferred red transferware instead. It was bright and cheery and warm, it matched all the other touches of red that I was steadily adding to my house. And then, not too long ago, I started to pick up some blue and white. I decided I really liked it and bought more and more, but until just recently, always thought that I should display it separately from my red transferware. 'Put like things together' is the mantra of displaying collections, but I don't think that always necessarily means the same color. 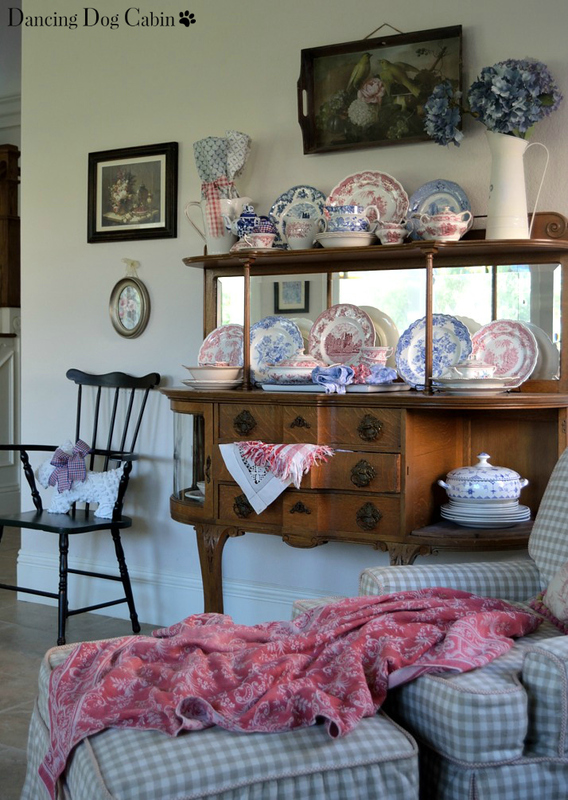 After all, the most dominant common theme of all these pieces is the 'transfer' pattern--- the organic, floral designs, little creatures, and romantic, fanciful scenes depicted on many of the plates-- patterns that are also repeated in other objects throughout my home. 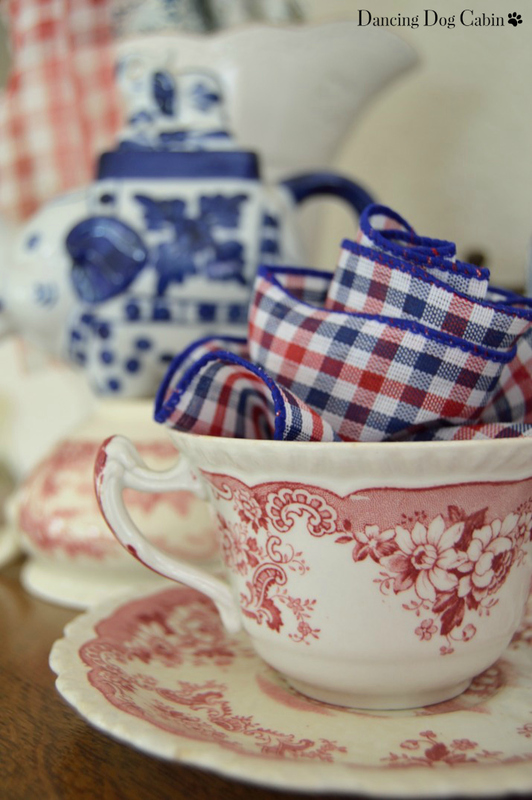 I find that mixing red- and blue-transferware looks just fine, in fact I think it looks pretty fabulous, not to mention patriotic! Just in time for the Fourth of July, I put it all together on the oak sideboard that my mom gave me. .....with the colors that I love, on the oak sideboard that once belonged to my mom. A wonderful piece of furniture (albeit with a missing door, that's why she was able to get it at a fire sale price), with no lack of lovely, detailed ornamentation that echos the patterns on the plates, serving pieces, and other ceramic-ware items that it displays. So.... here is where I am now in my transferware-collecting journey. I started off with red, made a detour to brown, as shown here in this post, and ultimately came back to the blue that I grew up with. And most importantly I broke out of the mindset that only the same colors can be displayed to together (although I'm pretty sure that I won't display the brown, red, and blue together-- maybe the blue and the brown, we'll see). It's ALL beautiful! I have recently (well, 2 years ago) began to collect the blue and white, but I think the red and white is pretty, too! And I love that cabinet. It all goes together so well, and I really enjoyed looking at this today. Thank you Cynthia! I'm glad you were able to visit and enjoy this post. 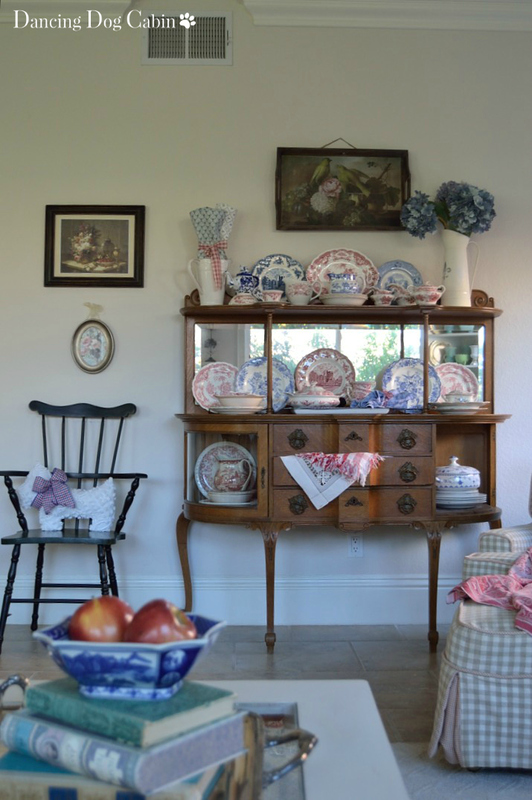 Love your pretty dishes...love that beautiful antique cabinet...love the whole area!! Thanks Martina! Have a great week! Melissa, that sideboard is something else! It's gorgeous and so is your transferware. 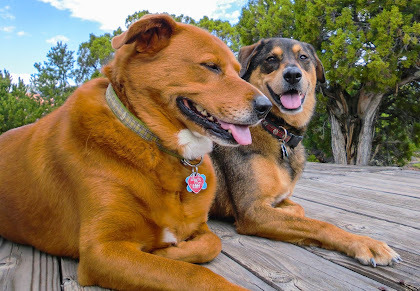 Have I mentioned that I love your pictures? They capture everything perfectly. Thanks so much Rue! I hope you had a wonderful 4th weekend too! I totally agree that they look great together! No need to separate the colors at all. Thank you Cat! I like everything together too. They look lovely together! Your sideboard is unusual and very pretty, what a nice heirloom. Melissa, you are one lucky lady to receive that oak sideboard from your mother! She has excellent taste as do you! Love the photos, you have a great eye. Love the combining of the two colors, I think brown would be great with either color as well. Thank you Janet! This was a very lucky find for my mom and I'm thrilled to have it. Have a great week! 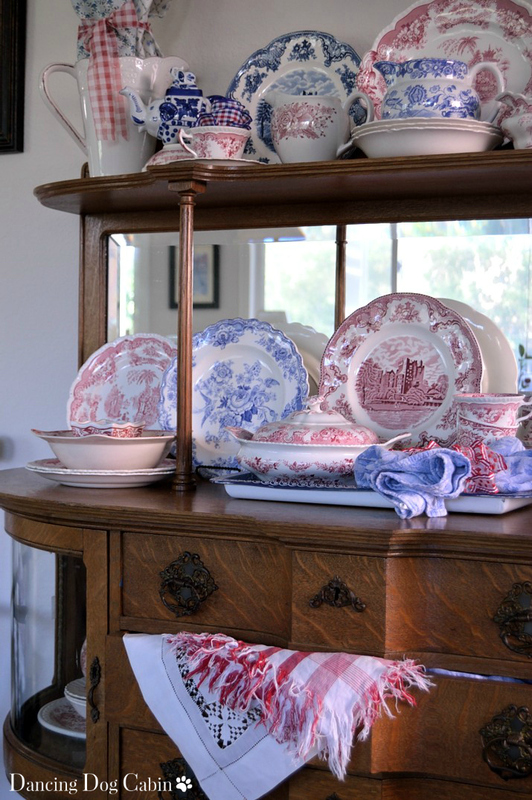 I've had my red & white transferware packed away, but now I see how lovely it looks displayed along with the blue. Your sideboard is beautiful and you've artfully displayed your collections. Thanks for sharing! Visiting from SSS. Your blue and red is beautiful together! The more the merrier, I think. Thanks Stacey! I agree-- go with whatever looks great together, no matter if it's old or new. And being easy on the wallet makes it even better. 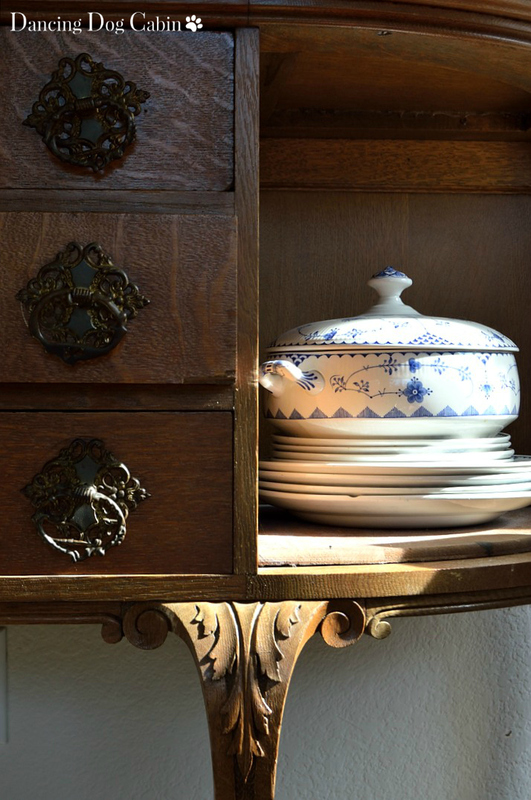 Your cabinet is beautiful and the dishes help it be star of the show!! There is nothing better than gifts from Mom, and they get more precious in future years! Thank you! Yes, the things that my mom gives me are extra special. So pretty! I really like the two colors mixed together. They compliment each other beautifully. 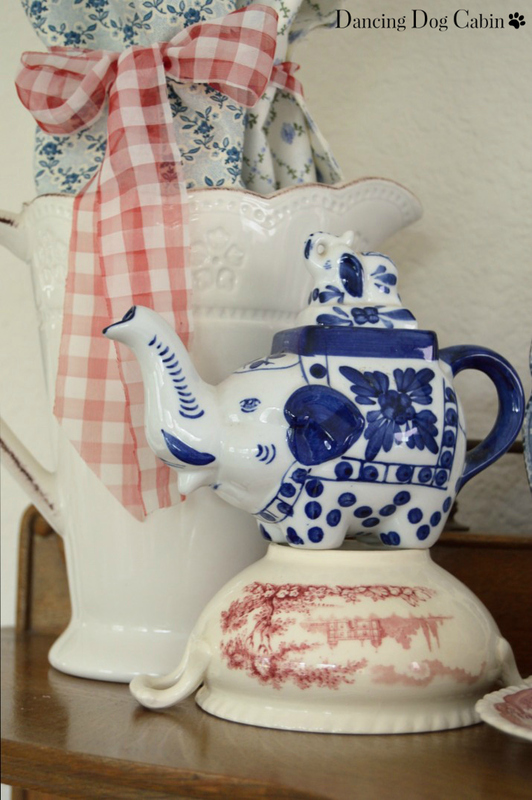 I love transferware! You have some lovely pieces here, and everything is arranged in such a charming fashion. Thanks for sharing. 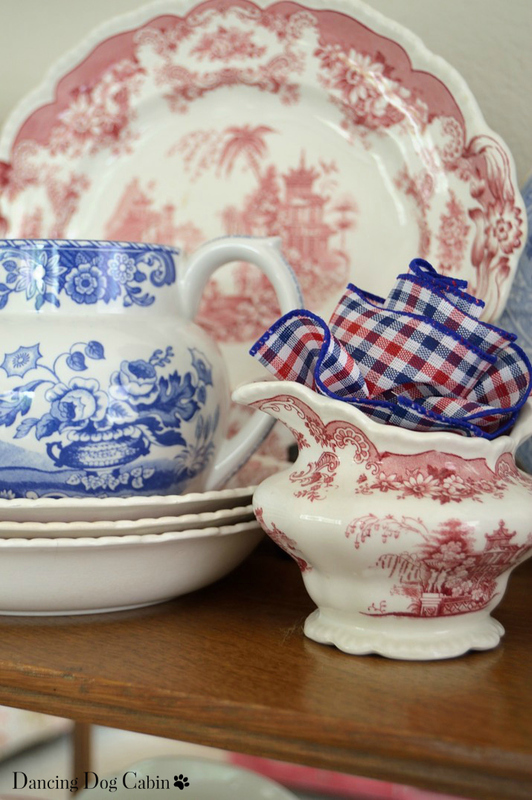 I adore the blending of the blue and white and the red and white transferware, dear one!!! Your display is stunning, indeed!!! To me, there is nothing more marvelous than displaying dishes!!! Thank you Pat! Yes, pretty dishes look fantastic just about anywhere. 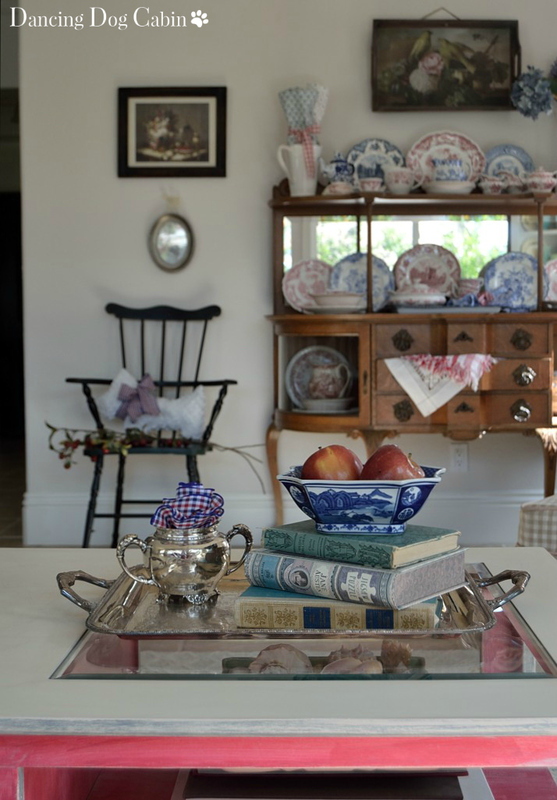 Beautiful collection and your sideboard is gorgeous! Thank you for your very kind words Kimberly! See you Monday night. 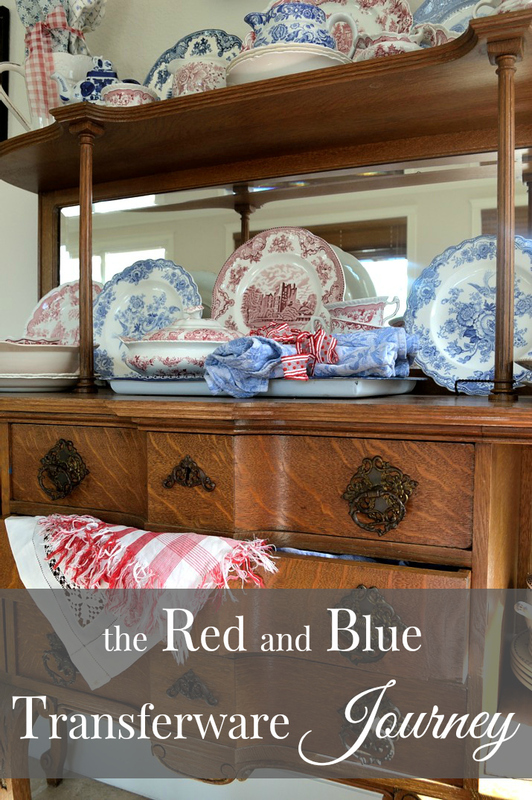 Wow, the red and blue dishes look fantastic together on that sideboard. I love that you started with blue, then red, then blue again. Funny how collections change as they grow. Thanks for sharing at Inspiration Thursday! See you next time! 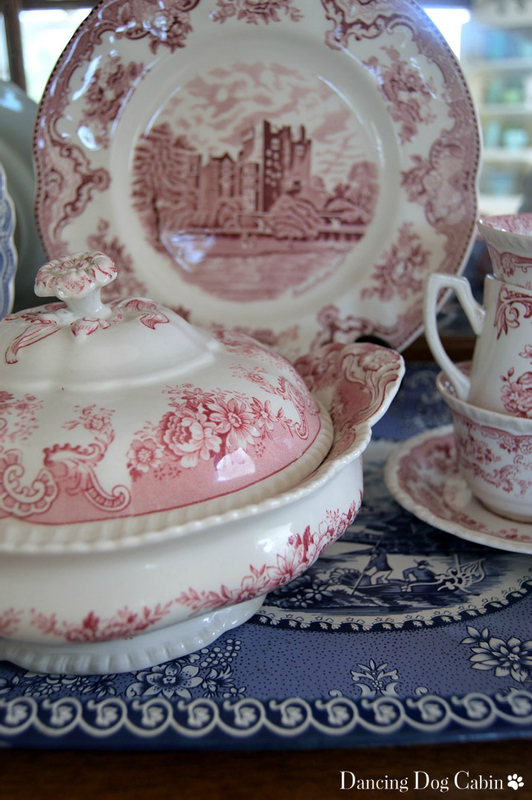 I so love transferware!! Yours is beautiful! Thanks for sharing at Home Sweet Home! Thank you Sherry! I know how you feel; it's so hard to stop buying it! It is downright gorgeous! I started collecting red about 3 years ago, but like you; I have ran across some blue and couldn't resist. I haven't mixed mine together yet, but love the look! Especially love that sweet piece you have that has both red and blue on it. Gorgeous collection! Thanks for sharing with SYC. It's hard for me to pass up ANY color, I love it all. your sideboard is just amazing. It reminds me of my great-great grandmother's that I blogged about a couple of weeks ago. Your's is more ornate by far, but same time period. I never even noticed the missing door til you mentioned it! Thank you Debra, I can't resist color either. Funny, every time I look at my sideboard, the first thing my eye goes to is the missing door. Red and blue look terrific together! I collect blue and white. The cabinet is lovely as well! Thank you Mimi! How wonderful to have grown up eating off of transferware. Thanks for inviting me. 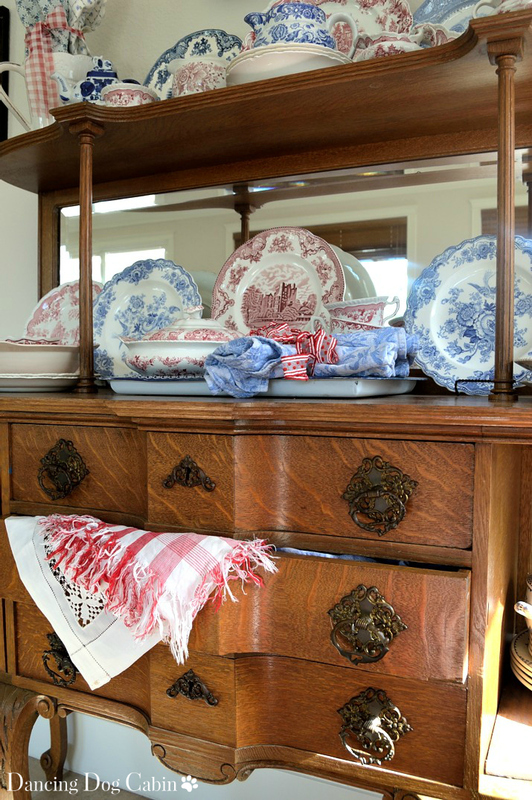 You have a lovely collection of transferware. And I like the way you have combined all the special pieces you have. It's a beautiful display. Have a great weekend. Red, white, and blue isn't just for the 4th! Fun seeing the variety you have collected. Very true-- it's still sitting out on my sideboard!